Okay ladies, get ready for another silly-easy slow cooker recipe from me. Today I’m sharing Slow Cooker Italian Chicken. When I make this slow cooker recipe even the little kids comment on how good the kitchen smells -yum! Your slow cooker – don’t forget that 🙂 I use an 8 qt slow cooker. And sweetie, all you do is dump the chicken in your slow cooker. Pour in your bottle of Italian Dressing, and BAM! 4-6 hours later you have a fantastic dinner. Cook on 4 hours high or 6 hours low. This recipe is both Trim Healthy Mama Friendly + Low Carb. 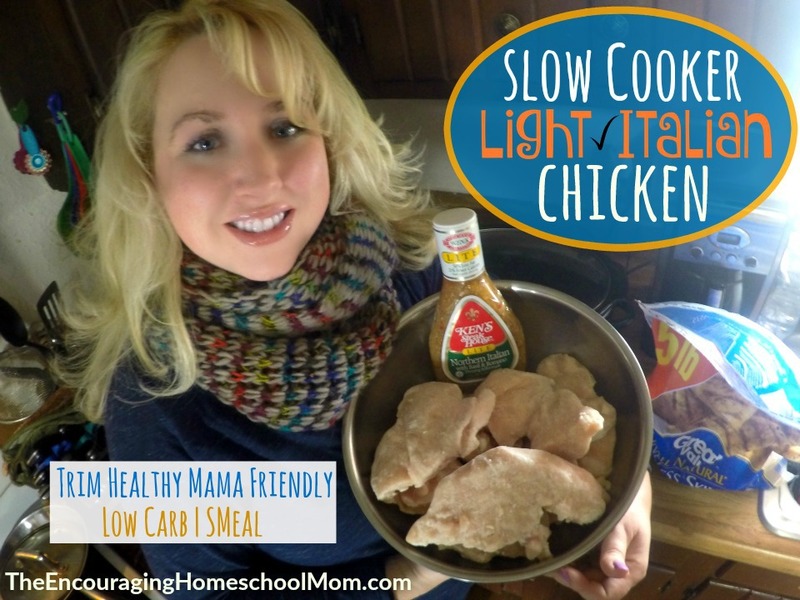 To make this Slow Cooker Italian Chicken Recipe as a freezer meal just combine your frozen chicken breasts with the one bottle of dressing in a gallon size freezer bag. Label the bag, remove any extra air, and place it in your freezer. Later, place the frozen gallon bag in your refrigerator from your freezer overnight to defrost. The following day dump the contents of your Italian Chicken Meal into your slow cooker and follow the cooking times above. Watch how I make this Slow Cooker Italian Chicken Recipe in today’s vlog. You can click here to watch all of my cooking vlogs! *Note the internal temp of your large family Italian Chicken. If the internal temp is not reached place back in IP for 10 minutes and check again. Because of the variables with pressure cooking, it’s not always a perfect science and sometimes needs additional adjustments. The USDA recommendations a minimum internal temperature of 165 degrees for poultry. Thanks for this video….I love your idea about making the cabbage soup. I need to try that too! Thanks for the video! My crock pot lid handle also came off. I ordered a pack of 2 from eBay (included the screws to install). It worked great! !